The country of Malaysia is always well-known to many as being a unique country with rich cultural backgrounds and historical traditions. Due to the various cultural backgrounds of the societies in Malaysia, Malaysia has become a country consisting of societies with different races, religions, and cultures. Of course, all races are united in the society; however, it is also undeniable that every single race and culture has its very own unique background that will astound the other races. Negeri Sembilan is one state of Malaysia which is rich in its very own culture – the Minangkabau culture and tradition. The Minangkabau culture in Negeri Sembilan has a very long history, and thus, many footprints and historical marks have been imprinted in the state, allowing the future generations and also the foreigners to know more about the culture and in the same time, appreciate the effort of the predecessors in preserving their very culture up till today. Thus, if you are interested with the Minangkabau culture, the Rumah Contoh Minangkabau in Negeri Sembilan is one place you must not miss when you visit Negeri Sembilan. The Negeri Sembilan Rumah Contoh Minangkabau has a very long history dated back to 1898 – the day it was constructed. The Minangkabau generations as well as the local people had been contributing a lot in preserving this precious historical landmark and thus, if you visit these houses, you will definitely be able to see clearly the Minangkabau style building standing firm and tall in the state. In the same time, you will also be exposed to the unique crafting on the Rumah Contoh Minangkabau walls, all based on the verses from the Holy Kuran. Although the building was destroyed once in 1924 by England for exhibition purposes, the love of the Minangkabau generations and the local people towards the culture and tradition remain unchanged, to the extent that they are willing to put in immeasurable effort and contribution to rebuild the Ruman Contoh Minangkabau. This fact provides you with a reason strong enough to visit the Rumah Contoh Minangkabau base on its historical background. 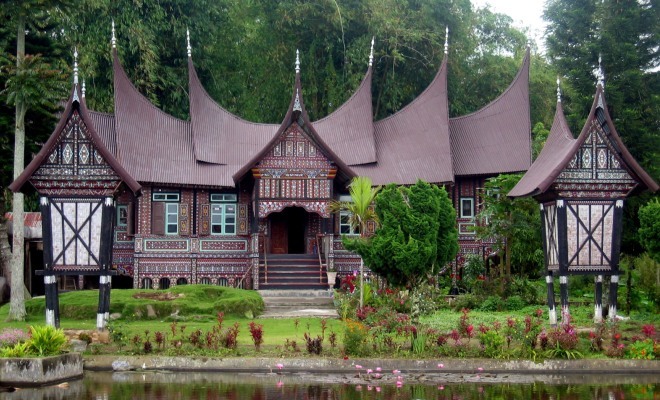 One of the most distinctive features of the Rumah Contoh Minangkabau is its wooden single roof. This feature is an important feature distinguishing the Minangkabau culture with the other cultures. Upon arriving at the Rumah Contoh Minangkabau, you could also take the chance to take pictures of the traditional house with your family for future references or as a remembrance for being able to witness this unique culture with your own eyes. From budget inns to all-inclusive resorts and private bungalows, PD is for the beach lovers. Wide range of accommodations to suit every budget in this serene and quite township.